Still a young man, Clays left what had become his inspiration, the sea, and moved to Paris in search of official artistic training. 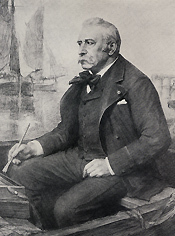 He studied under Horace Vernet, a well-known military painter. In Clays’ attempt to absorb Vernet’s methods and advice, he was only disappointed since he was told that his art lacked direction. Instead of remaining with the artist, he entered the atelier Suisse, a popular atelier for many aspiring artists where one concentrated most heavily on figure drawing. Outside of the lessons received at the atelier Suisse, he also “sought out the secrets of the countryside around Paris, often elusive in its particular poetry.” (Montrosier, 38) One of these areas outside of Paris was Saint-Ouen. Here there were “corners of greens, great hundred year old trees, some patches of prairie animated by the beasts in pasture, with, all around, the Seine unfolding the long course with its limpid water.” (Montrosier, 38) The Barbizon school and the interest in landscape painting in France at this time was exerting an influence over his thematic choices. 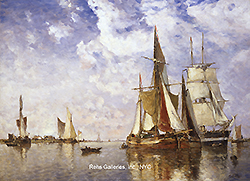 His paintings had come to be revered for their fresh and truthful qualities, which were in contrast to many other painters who relied too heavily on an idealized version of the reality of the sea. It was written at the time that “For the first time a sincere painter applies himself to showing the sound joy of his eyes.” (Eekhoud, 502) After a productive career and several awards, such as the Order of Leopold, Clays died in Brussels on February 10th, 1900. 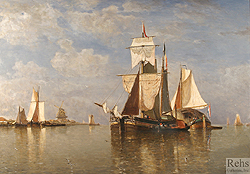 In a final summation of his work Eekhoud wrote that “The greatest merit of Paul-Jean Clays…was to have released his genre of painting from the conventions and the routines which made marine imagery a tributary of the historical genre.” (495) It was this departure from the established traditions that attracted audiences and garnered their praise s, showing a new direction in the history of marine painting in the nineteenth century.